The Métis scrip system was implemented after the 1869-70 Red River Resistance. In the aftermath of the resistance, the Canadian government created Manitoba under the Manitoba Act, which set aside 1.4 million acres of land for the children of Métis families. Once this land grant was exhausted, the government supplemented it through scrip distribution to individuals rather than the collective. In 1879, amendments to the Dominion Lands Act acknowledged that the Métis had outstanding claims to their lands in the North-West Territories (including land in what is now Manitoba, Alberta and Saskatchewan). Section 43 of the act indicated that the federal government had a fiduciary responsibility to protect Aboriginal rights (for both Métis and First Nations), and thus had a duty to limit non-Aboriginal settlement in a region until the local First Nations and Métis inhabitants had their Aboriginal title dealt with through treaty and scrip. Section 125 of the Act paved the way for the infamous scrip system implemented by the federal government in an ineffectual attempt to extinguish the land rights of Métis. The two types of scrip created for this process were land scrip and money scrip. When the system was first implemented, the value of the scrip provided to the Métis was either 160 acres of land or $160 cash to be used for the purchase of land. Later, the value was increased to 240 acres or $240. From 1876 to 1902, scrip was handed out by scrip commissions, which followed the treaty negotiators and travelled to various Métis communities in Western Canada. From 1899, Métis scrip was granted simultaneously in Treaty 8 (present-day northwest Saskatchewan, southern Northwest Territories, northern Alberta and northeast British Columbia), from 1906 in Treaty 10 (what is now northern Saskatchewan and a small part of Alberta), and from 1921 in Treaty 11 in what is now the Northwest Territories. Sometimes, some family members took treaty, while others took scrip. This occurred among First Nations people, too, as many took scrip and became Métis. This meant that even within one family, some family members would become Status Indians and others, Métis. The scrip system was flawed for many reasons, resulting in the systematic loss of Métis lands. The scrip commissions were advertised in newspapers and on posters. It is believed that the purpose of one of these advertisements was to alert speculators. There was also no protection against fraud — many had their names forged without their knowledge. As a general practice, land speculators bought scrip from Métis at very low prices and then sold it to the main chartered banks in Canada. Out of the 14,849 issued, land speculators ended up obtaining 12,560 money scrips. They also managed to leave the Métis with only one per cent of the 138,320 acres of land scrip issued in northwest Saskatchewan. Allotment: The amount of something granted to a specific individual for services rendered or something given outright to an individual. In the context of Métis history, allotment means the amount of scrip, in either land or money, granted to each Métis person by the federal government. Extinguishment: A legal concept used by the Canadian government that refers to the land rights of Aboriginal peoples. Before Canada could lawfully settle the lands, it had to legally extinguish the Aboriginal or Indian title of the people. These rights were usually extinguished by treaty or other written agreement. 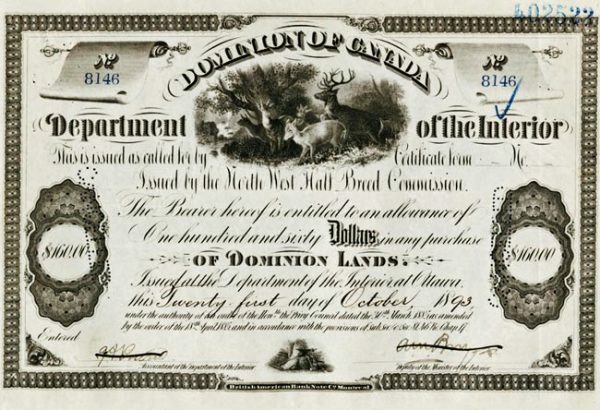 Dominion Lands Act: The Dominion Lands Act became law in 1872. The act provided free homesteads to those who applied to settle on farm and ranch land in Western Canada — provided they settled the land, farmed on it and made improvements to their property. The Dominion Lands Act also provided the legal basis for the establishment of the scrip system. Land claims: Legal challenges put forth by Canadian Aboriginal peoples to recover land that was taken away from them by the state. River lots: A traditional Métis system of land-hold tenure, river lots are long narrow strips of land fronting a river and stretching back inland for a specified distance. They could be as much as three kilometres deep but only 250 metres wide. Indigenous Title: Relates to the continuation of Indigenous land rights after the imposition of settler governments’ control of a territory. Within settler societies, including Canada, the Indigenous title of Indigenous Peoples has been increasingly affirmed through litigation. The Supreme Court ruling in Manitoba Métis Federation (2013) dealt with the 1.4-million acres of land guaranteed to the Métis. In another case, Morin v. Canada, a Métis land claim in northwest Saskatchewan, the plaintiffs are seeking a declaration that the Métis have continuing Aboriginal title to the land. In that case, the plaintiffs are seeking a declaration that the Métis have Indigenous title to the land.